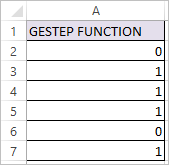 GESTEP Function in Excel tests whether a supplied number is greater than or equal to the certain threshold. GESTEP Function returns 1, if supplied number is greater than or equal to threshold [step].GESTEP Function returns 0, if supplied number is less than threshold [step]. number – The number to be tested. [step] – An Optional argument that defines the step size i.e. threshold. If [step] omitted, the default value 0 is used. 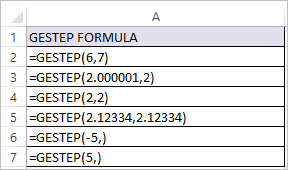 From Row number 2 to 5 GESTEP Function compares the value with specified threshold.